Bead-All, End-All! This is just the Greatest Combination Ever! The S21502 – Already assembled! A set of two - 2mm Inside Diameter End Tubes and Lobster Claw. A one-stop shopping wonder! 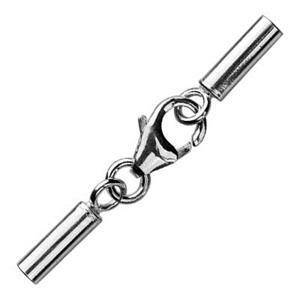 A perfect way to finish your Sterling Footage Chain necklaces when using bulk chain that is 1.9mm or less. Simply glue the ends of your chain – insert into the tubes and gently crimp.